The Danish financial sector is regulated under numerous acts. Banks, investment firms, management companies, insurance companies, pension funds and mortgage credit institutions are mainly regulated by the Danish Financial Business Act (FBA). Furthermore, the following, inter alia, all have their own separate regulations: alternative investment fund managers, investment advisers, payment service providers and issuers of electronic money. Danish financial regulation is influenced by both national and international regulatory trends, and Denmark implements most of the directives and guidelines of the European Union into its financial regulations. Certain regulations drafted and adopted by the EU are also directly applicable in Denmark. The Danish Financial Supervisory Authority (FSA) is the main supervisory authority in Denmark, although Nationalbanken, the National Bank, also has an oversight role. The definition must be read in conjunction with all the other financial regulations currently in force in Denmark, since the definition is supplementary to any assets or activities defined in such regulations. As previously mentioned, Danish financial regulation is to a large extent influenced by EU law. The Danish securities and investment laws are regulated both by the rules for securities and offerings thereof, and by rules for providing investment services related to securities, which in Denmark are defined overall as financial instruments. Prospectus requirements are relevant when offering securities to the public or having securities admitted to trading on a trading venue. Compliance with the rules on prospectus requirements must be ensured before offering securities to the public. Overall, the rules in the CMA apply to participants and their conduct on the capital markets. Although market abuse is regulated in MAR, we have not reviewed virtual currencies in terms of MAR, as this is outwith the scope of this chapter. However, this seems to be becoming increasingly relevant, as significant financial institutions have listed instruments that derive their value from virtual currencies. Similar to the definition of investment services, the definition of financial instruments under Danish law is an implementation close to the legal text of Annex I, Section C in MiFID II. A virtual currency, in comparison to the above definition, is not a financial instrument, but rather a negotiable security, and will therefore not per se be subject to the above described securities regulation, since virtual currencies are not included in the list of financial instruments. Under Danish law, there is no strict requirement regarding structure or legal identity before an asset may be defined as a financial instrument. It is therefore possible that a virtual currency can be defined as a financial instrument whereby the issuer or the virtual currency itself, or both (depending on the setup), will be subject to regulatory requirements. Accordingly, it seems that like FINMA, the FCA also focuses on the underlying purpose. It is our assessment that the financial instrument test to be performed under Danish law must be similar to that of FINMA and the FCA. The CMA applies to capital market participants and their conduct on the markets. As such, the CMA regulates different aspects of the Danish capital markets. In this section we focus on a possible prospectus requirement in connection with a public offering or admission to trading on a regulated market. The CMA is drafted so that all requests for the admission of securities for trading on a regulated market and all public offerings of negotiable securities in the EU or EEA are subject to the prospectus requirement. A prospectus is basically a document describing the major features and attractions of a particular asset or issuer. A prospectus must be prepared in accordance with the regulations applicable to a particular area. If a virtual currency falls under the definition of a financial instrument, an offering to the public would be subject to the prospectus requirement. If so, it would have to be assessed on a case-by-case basis whether an exemption from the prospectus requirement may be relied upon. To our knowledge, there are no virtual currencies listed on regulated markets. As such, we confine ourselves to a discussion of offerings to the public. securities for trading issued by collective investment scheme, however not closed-ended. An offer to the public of negotiable securities can also be exempted based on the type of addressees of the offer, the amount of addressees, the denomination of units offered and the minimum considerations per investors. Provided that a particular ICO is not subject to the prospectus requirements, the relationship between the issuer and the sponsor in the ICO will, under Danish law, if applicable, be regulated by the agreement of signing the virtual currency hereunder the Danish laws on obligations and contracts (see our discussion in Section VII). If a virtual currency falls within the definition of a financial instrument, conducting any of the investments services listed in the FBA will be subject to Danish regulations, the FBA and other EU regulations. While the consequences of this lie outwith the scope of this chapter, it must be noted that this may influence the distribution of the virtual currencies, the pricing model with regards to both the issuance and the administration (if any) of the virtual currency, and the disclosure requirements. The business of banking and money transmission is regulated in the FBA regarding credit institutions, and in the Danish Act on Payments (PA) regarding payment service providers and issuing e-money. According to the FBA, an entity carrying out activities comprising receiving from the public deposits or other funds to be repaid, as well as activities comprising granting loans on their own account but not on the basis of issuing mortgage-credit bonds, must be licensed as a credit institution. We have not yet seen any issuers of virtual currencies that would qualify as a credit institution in accordance with the above conditions, which assessment must be made at the level of the issuer. For the issuer to fulfil the above conditions, its financing must be based partly on deposits or other funds to be repaid. An issuer of virtual currencies will likely be using virtual currencies for financing. We have not seen virtual currencies being used in a way whereby there was an immediate request for repayment. It is therefore our assessment that the purchase of virtual currencies is unlikely to be deemed as deposits or other funds to be repaid, due to the way virtual currencies are traded. A purchaser's possibility of redeeming the purchase amount relies in most cases on the liquidity of the virtual currency (i.e., supply and demand). In contrast, the blockchain technology seems highly relevant for the market of credit institutions. However, as the technology continues developing, we may see advances in the market of virtual currencies that change aspects or the use of virtual currencies whereby they may be seen as deposits. Lending business not based on deposits is considered a non-regulated service under Danish law, although the issuer will have to be registered in accordance with the Danish Act on Measures to Prevent Money Laundering and Financing of Terrorism (AML Act). Again, the focus must be on the issuer. Under the PA, the definition of money remittance is as a 'payment service where funds are received from a payer for the sole purpose of transferring a corresponding amount to a payee or to another payment service provider acting on behalf of the payee, without any payment accounts being created in the name of the payer or the payee'. 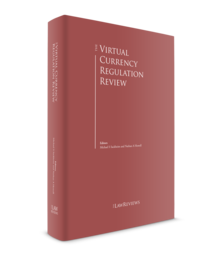 Since virtual currencies are not defined as a currency as such, transferring virtual currencies cannot be defined as a money remittance service. It must be noted that it may be possible to create a money remittance service based on blockchain technology and virtual currencies. As such, a person using virtual currencies or blockchain technology, or both, to transfer money on behalf of other persons must be aware of whether the service will fulfil the definition of at least money remittance. As such, the focus must be on the issuer and which services the issuer provides. Furthermore, under the PA e-money is defined as an electronically or magnetically stored monetary value representing a claim on the issuer that is issued on receipt of funds for the purpose of making payment transactions, and that is accepted by people other than the issuer of the e-money. Before virtual currencies can become e-money, it is required that the value was electronically or magnetically stored, and represented a claim against the issuer. We seldom see both of these requirements being fulfilled by virtual currencies. Blockchain technology, however, seems rather purposeful for the issuance and use of e-money. Furthermore, Denmark has chosen to specifically regulate instruments that were formerly known as payments surrogates. These instruments are non-free electronic services that can be used to acquire goods and services and make payment transactions with the payer's consent to carry out the transaction by telecommunication. The payment goes to the operator who manages the communication network, and who only operates as an intermediary between the user of the payment service and the supplier of goods and services, unless the service constitutes a payment service. It is our assessment that virtual currencies as such will not fall under the definition of the instruments formerly known as payment surrogates. However, as the technology progresses there may be certain virtual currencies or uses thereof that would fall under this part of the regulations. Denmark has chosen to adopt a purely national regulation of currency exchange businesses (i.e., this part of the AML Act is not an implementation of AMLD IV or any other EU directive). This does not influence virtual currencies as these are not considered a fiat currency. Exchanging a fiat currency for a virtual currency is therefore not a currency exchange. It is expected that a change in the AML Act will soon be implemented: see Section XI. There is no direct regulation of exchanges alone. The connection between the purchaser of a virtual currency and the exchange where the purchase has been made will, if Danish law is applicable, be regulated under the Danish laws on, inter alia, contracts and good business practices. If a virtual currency falls within the definition of a financial instrument as mentioned earlier, the exchange will be subject to Danish financial regulation, that is under the FBA, and to MiFID II and MiFIR. If so, buying or trading virtual currencies on the exchange will be an investment service. This will impact exchanges' business models in numerous ways: see our review in this regard in Section II). There is no regulation of mining for virtual currencies. Even if a virtual currency would be defined as a financial instrument, it is our assessment that the miner would most likely not be deemed to provide any regulated services, as the miner itself will only provide IT resources to the particular trade with a virtual currency. There is no direct financial regulation of either issuers or sponsors of ICOs. The same applies for investors in virtual currencies. The FSA has recently and for the first time considered whether a specific ICO was within the scope of Danish financial regulation. In the decision the FSA considered whether the ICO was subject to the prospectus rules and whether the token offered was covered by the e-money rules. The token in question was issued through the ICO with the specific purpose of being a payment instrument on the issuing company's trading platform when – and if – it was established. Users of the platform were able to acquire the tokens by investing in the ICO. The FSA found that the token offered was not a transferable security and thus not within the scope of the prospectus rules. The reason for this conclusion was that the token concerned did not impose any economic or decision-making rights over the issuing company or the issuing company's earnings on the purchaser. If Danish law is applicable, the relationship between the issuer and the sponsor or initial investor in an ICO as well as the relationship between the sponsor and subsequent purchasers will be regulated under, inter alia, the Danish law of contracts and obligations law. The marketing of virtual currencies will be regulated under the Danish Act on Marketing. Below we highlight one aspect of Danish contract law that will be significant for issuers when raising funds via an ICO. A key aspect of Danish contract law is the duty to loyally inform the other contracting party (i.e., a duty of loyal disclosure). Under this duty, the seller (i.e., the issuer of the ICO) must ensure that the purchaser (i.e., the sponsor) has received all the information that would be vital in influencing the sponsor's decision and that the seller knows or should know. The level of information required to be provided to a sponsor will depend on the particular virtual currency. The duty to loyally disclose information to the sponsor does not include a requirement to disclose all the information provided in a regulated prospectus, as the duty is seen as a general obligation up to and in contracts. As the requirements for a prospectus in general are considered best practice, it is our assessment that an issuer should review which parts of the requirements for a prospectus may be vital for a potential sponsor. Unfortunately, the prospectus requirements cannot be used as a checklist for the necessary information, since the issuer may be required to provide information on other matters as well to potential sponsors. As there currently is no financial regulation applicable to virtual currencies, the risk of enforcement against an issuer in non-compliance with the Danish financial regulations must be considered low. If a virtual currency qualifies as a financial instrument, as described above, the offering thereof or trade with the virtual currency in non-compliance with the Danish financial regulations can be enforced accordingly. A breach thereof can be enforced with a fine or imprisonment of up to four months, or both, unless a stronger punishment is deserved under other legislation. Fraud is illegal under the Danish Criminal Code regardless of whether virtual currencies are not directly regulated elsewhere in the Danish regulations. If a person obtains an unjustified gain for him or herself or others it is fraud, and it will be punished in accordance with Section 279 of the Criminal Code. Those convicted of fraud can be subject to prison sentences of up to one year and six months according to Section 285. Depending on the circumstances of the virtual currency and the issuance hereof, sanctions may be enforced in accordance with other aspects of the Criminal Code, which may have a higher maximum penalty. In terms of breaches of the financial regulations, it is usually the FSA that introduces cases and passes them on to the State Prosecutor for Serious Economic and International Crime. The State Prosecutor can also pursue matters on its own account. No Danish tax acts deal specifically with virtual currencies, and virtual currency income is taxed under the Danish National Tax Act dating from 1922. Following decisions of the Danish Tax Council18 in 2016, 2017 and 2018, greater clarity regarding Danish taxation of virtual currencies is now available. For Danish tax purposes, any disposal is a tax event, regardless of whether a virtual currency is sold, or is exchanged for another virtual currency or for an entirely different type of asset. Danish exit taxation may furthermore be triggered upon cessation of Danish tax residency. Income realised on a disposal of assets is generally not subject to tax unless deemed income from speculation or from active trade with the assets. Technically, the individual intent is decisive for whether a transaction may be deemed speculation. Technically, the possibility to argue that exchanges of virtual currencies is not speculation exist. Following a decision of the Danish Tax Council of 9 March 2018,19 all acquisitions and disposals of virtual currencies should, from a practical point of view, be deemed by the Danish tax authorities to be speculation, meaning that income realised is taxable in Denmark. An individual realising gains on virtual currencies must accordingly include the gains as personal income being subject to tax at a marginal rate of approximately 53 per cent. Conversely, losses incurred may be deducted. The tax value of a loss will, however, be significantly lower (approximately 27 per cent) than the marginal tax rate applied to a gain. If a Danish company may buy and sell virtual currencies, the net income generated will be subject to Danish tax at the standard corporate income tax rate of 22 per cent. To the best of our knowledge, no published decisions of the Danish tax authorities have yet dealt specifically with income derived from the mining and subsequent sale of virtual currencies. in principle, an individual may be deemed to act as a professional in relation to the mining of virtual currencies. If that is the case, the individual will be allowed to deduct and carry forward losses similar to a Danish company. Following decisions of the Danish Tax Council, the Danish practical position is that income derived from buying and selling Bitcoins is subject to Danish tax. If an investor is an individual, income is almost certainly income from speculation, and as such subject to a marginal tax rate of approximately 53 per cent. Losses may be deducted, but will only carry a tax value of approximately 27 per cent. A corporate investor will be subject tax at the Danish corporate tax rate of 22 per cent. An individual mining virtual currencies will almost certainly be deemed to be carrying out a hobby, and as such be made subject to tax on the net income realised in the income year, but not be allowed to deduct losses in other income or carry forward losses. It is still unclear how virtual currencies shall be treated in terms of auditing. According to the Danish Financial Statements Act, virtual currencies are not themselves described. Virtual currencies should most likely be treated either as intangible fixed assets or inventory. The relevant category for each virtual currency depends on an entity's usage of that virtual currency. On 5 July 2016, the European Commission proposed an amendment to AMLD IV. The proposal is designed to bring virtual currencies within the scope of the AMLD IV, and has been adopted by the European Parliament and the Council. One of the main changes is that virtual currency exchange platforms will be subject to requirements under AMLD IV. This will result in providers engaged primarily and professionally in exchange services between virtual currencies and fiat currencies to be within the scope of AMLD IV. The Danish implementation of the amendment to AMLD IV has not yet been proposed. However, owing to the recent political climate in Denmark, our expectation is that Denmark's implementation will stay rather close to the legal text of the amendment. 1 David Moalem is a partner and Kristoffer Probst Larsen is a junior associate at Bech-Bruun. 6 Regulation (EU) No. 596/2014. 17 See U.2004B.133, David Moalem, PhD, 'Fortielser ved kontraktindgåelse – Om obligationsrettens loyale oplysningspligt'. 18 The supreme administrative appellate board within the Danish tax authorities comprising legal experts, experts from the Danish tax authorities and political appointees.